There is a false teaching that many flock to, but could not be further from the truth of Gods holy word and that is the false promises of reincarnation! It would be frivolous for God to create a person but when they die they would be born again into a different person or God forbid come back as an animal as sadly some believe! There is only one promise made of us living again and that is to of lived our life for Christ and gain eternal life by doing so (1 John 2:23-25), 23 Whosoever denieth the Son, the same hath not the Father: he that acknowledgeth the Son hath the Father also.24 Let that therefore abide in you, which ye have heard from the beginning. If that which ye have heard from the beginning shall remain in you, ye also shall continue in the Son, and in the Father.25 And this is the promise that he hath promised us, even eternal life. (John 10:27-29). We have confirmation in scripture that when our life is over here we are destined for the grave, but it is at the great white throne judgment are the books opened and we are then judged by what is written in them according to our works and as christians we pray our name is written in the book of life! (Revelation 20:11-15). 11 And I saw a great white throne, and him that sat on it, from whose face the earth and the heaven fled away; and there was found no place for them.12 And I saw the dead, small and great, stand before God; and the books were opened: and another book was opened, which is the book of life: and the dead were judged out of those things which were written in the books, according to their works.13 And the sea gave up the dead which were in it; and death and hell delivered up the dead which were in them: and they were judged every man according to their works.14 And death and hell were cast into the lake of fire. This is the second death.15 And whosoever was not found written in the book of life was cast into the lake of fire. 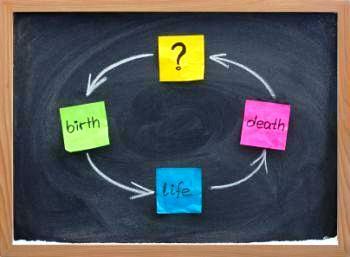 Reincarnation is a great deception many buy into, but scripture teaches no such scenario, but we are to live this life as best we can for there is no work, nor device, nor knowledge, nor wisdom, in the grave where we are going(Ecclesiastes 9:10,11). 10 Whatsoever thy hand findeth to do, do it with thy might; for there is no work, nor device, nor knowledge, nor wisdom, in the grave, whither thou goest.11 I returned, and saw under the sun, that the race is not to the swift, nor the battle to the strong, neither yet bread to the wise, nor yet riches to men of understanding, nor yet favour to men of skill; but time and chance happeneth to them all.